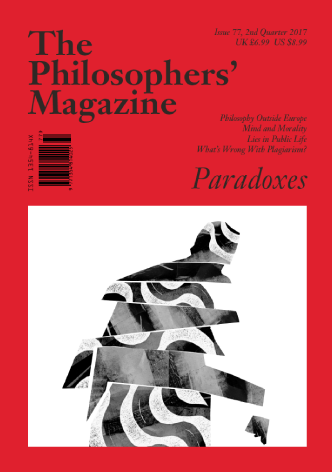 We publish philosophy that’s clear, thought-provoking, and relevant. Our contributors are mainly professional philosophers who care about good writing and about being understood. Contributors and interviewees include Kwame Anthony Appiah, Ronald Dworkin, Martha Nussbaum, Peter Hacker, Kit Fine, Elliott Sober, Frank Jackson, Patricia Churchland, David Chalmers, Christine Korsgaard, Simon Blackburn, Mary Midgley, Peter Unger, Havi Carel, Jennifer Saul, Simon Critchley, Ray Monk and Nassim Nicholas Taleb. Each issue features a mix of essays, interviews, opinions, columns, news and reviews. You can access a free sample issue here.